Further, Implementation Cell, 7th CPC, Department of Expenditure, Ministry of Finance has issued clarifications in this regard vide OM No.1-6/2016-IC dated 3rd August, 2017 (copy enclosed) [Click to See]. Is that possible, the four persons who are working in same post same cadre and same grade pay and thier pay difference to each other 3 percent like 17070 ,16570,16080 and 15610 thier pay fixed on 31/01/2016 Rs 44900. How it may be possible that the person who are senior to each other at least three to four years thier pay may be fixed equal. It will create a great annomaly if they are not given bunching benefit. As per the circular dated 03/08/2017 they are not eligible for bunching becsuse thier pay is below the 6 th pay entry level i. e 17140. In the OM Dated 3rd Aug,2017,the Fin Min has clarified that while migrating from 6th CPC regime to 7th CPC Pay Matrices.,wherever bunching of stages are noticed 1 extra stage may be allowed for every 2 increments or stages got bunched. This is the authoritative clarification to be followed by all ministries and departments uniformly and this position has also been confirmed by the Controller General of Accounts in letter dated 10th Aug 2017. 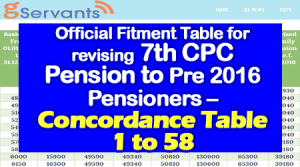 So for pre-2016 pensioners also,while fixing their pay under 7th CPC pay matrices for giving parity in pension as per modified parity scheme . The CG pensioners associations and Bharat Pensioners Samaj should take up the matter with Finance Ministry to get authoritative clarification to implement bunching benefit scheme to pre-2016 pensioners also.